Atlassian tools like Jira are seamlessly integrated into Dynatrace. Atlassian JIRA represents one of the most popular issue tracking systems available today. Many development and operations teams worldwide use Atlassian JIRA for seamlessly tracking their progress. The ability of JIRA to manage issues, trigger workflows, and track code and production changes is crucial for modern DevOps departments. 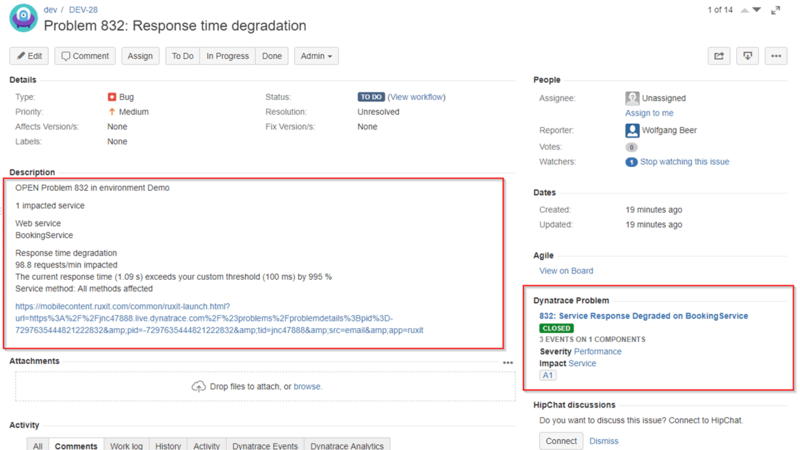 Directly connecting your Dynatrace application performance monitoring platform to your Atlassian JIRA environment saves a lot of manual work. The out-of-the-box Dynatrace to JIRA integration completely automates the reporting of Dynatrace detected problems and root causes into your JIRA project. The integration of JIRA in Dynatrace works seamlessly. 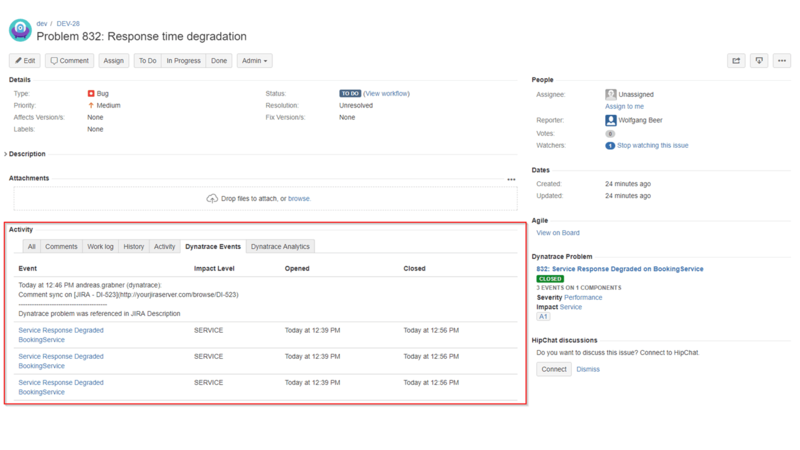 The Dynatrace JIRA Cloud plugin that is available through the (JIRA) Atlassian marketplace, allows the responsible team members to view the live status of ongoing problems. The plugin shows the problem evolution over time so that your team never misses any important information. Therefore, all team comments are automatically synchronized between JIRA and the problem identified by Dynatrace. The Dynatrace plugin provides all the relevant problem related properties that are indexed by JIRA. That makes these values available for advanced searches via JQL (JIRA Query Language). 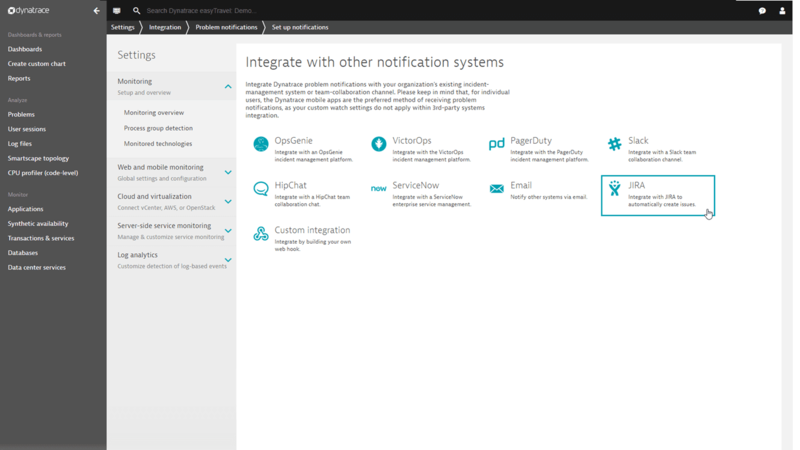 After installing the Dynatrace plugin you can query for problem severity, tags, root cause or impact level. To install the Dynatrace JIRA Cloud plugin, either choose our plugin from the (JIRA) Atlassian marketplace or upload the Dynatrace plugin definition directly from us. In case you would like to run your own plugin instance, the Dynatrace integration for Atlassian JIRA Cloud is available on Github. Test Dynatrace and its Atlassian JIRA Cloud integration today!